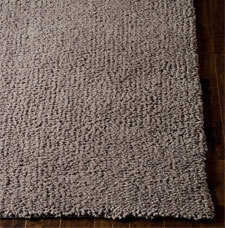 Puli is a collection of luxury plain shaggy rugs made by Calvin Klein. The rugs feature a super soft polyester pile made of thin strands that are grouped together and twisted to give the appearance of chunky yarns. The process of grouping and twisting ultimately results in a unique highly textured look in plain solid colours. Furthermore the Puli rugs are available in neutral colours which will make a good match to any room setting.